Station Hollywood: Bahubali 2 broke all the records, the photography and effects were outstanding. Bahubali 2 broke all the records, the photography and effects were outstanding. Bahubali 2 broke all box office records, the photography and effects were sensational. Bahubali 2 released at the end of April, 2017, broke all the box records in India. The film had been named Bahubali 2: The Conclusion. SS Rajamouli directed the film. 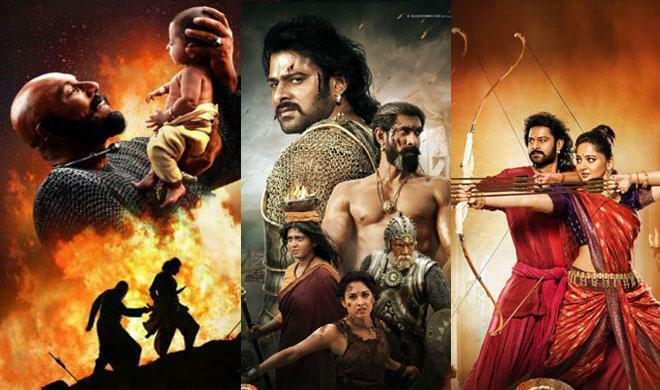 It is the sequel of the film Bahubali: The beginning. After being released in Telegu and Tamil the film had been translated in all the Indian languages. With a budget of Rs 250 crores, the film already had done business of more than 550 crores. The film is even running strong in the theatres and has all possibility of crossing 600 crores. After Prabhash (Amarendra Bahubali) was declared king of Mahismati, his mother Ramya Krishnan (Rajmata Sivagami) looked for a bride for Bahubali. Bahubali and Katappa (Satyaraj) went to tour the entire Kingdom. Bahubali fell in love with Anushka Shetty (Devasena), the princess of Kuntala Kingdom. Rana Daggubati (Bhallala Deva), the brother conspired due to advise of his father Nasser (Bijjaladeva) and got the promise of Ramya Krishnan to marry Anushka Shetty. Ramya Krishnan promised him the bride without knowing Bahubali was in love with Anushka Shetty. When the marriage proposal was send by Ramya Krishnan to Kuntala Kingdom, Anushka Shetty rejected the proposal. Ramya Krishnan ordered Bahubali and Katappa to capture her and bring her to Mahismati. In the meantime Kuntala was attacked by Pindaris (a dacoit community). Amarendra Bahubali saved kingdom of Kuntala with his bravery. He convinced Anuskha Shetty and brought her to Mahismati. When the misunderstanding was unfolded, Bahubali was given the choice either be the king of Mahismati or marry Anushka Shetty. He married Anushka Shetty. Rana Daggubati became the king. On killing one of the generals who molested the women, Bahubali was banished and asked to leave the kingdom. Anushka Shetty gave birth to Bahubali’s son Mahendra Bahubali. Rana Daggubati with Bijjaladeva hatched a plan and convinced Ramya Krishnan that Bahubali wanted to kill the king. So Katappa was ordered to Kill Bahubali. Under compulsion Katappa stapped Bahubali from the back. But Katappa unfolded the truth before Ramya Krishnan, that Bahubali never wanted to kill Rana Daggubati. Ramya Krishnan, with the baby Mahendra Bahubali declared before the people that his father Amarendra had died, but Mahendra is the future king of Mahismati. Ramya Krishnan, saved the little baby, Mahendra Bahubali, but died from sword of Rana Duggabati. Kuntala was destroyed and Devasena (Anushka Shetty) was kept as prisoner. Mahendra Bahubali grew up, learned guerilla warfare and with the men of king of Kuntala (Meka Ramakrishna) who was ousted from Kingdom of Kuntala made his force and faced Rana Duggabati. Rana Duggabati, by treachery again captured Anushka Shetty, the mother of Mahendra Bahubali. A furious war took place in the palace of Mahismati. Mahendra Bahubali smashed Rana Duggabati and burned him alive in the pyre prepared by Anushka Shetty (Devasena). Mahendra Bahubali became the king and Tamanna (Avantika) the queen of Mahismati. The performances of Prabhash, Anushka Shetty, Ramya Krishnan, Satyaraj were outstanding by every yardstick. Anushka Shetty looked very beautiful in the film. Prabhash with his muscular body and kingly looks stole the hearts of millions of Indians. The technical excellence took the film to Hollywood standard. Credit goes to KV Vijayendra Prasad, the screen writer, RC Kamalakanan, (visual effects), Kotagiri Venkateswara Prasad (Editing), PM Satheesh (Sound Designer), King Solomon, Lee Whittaker, Kecha, and Peter Hein, (stunt sequences). Those who saw the film in big theatres, realize that they have not seen an Indian film of such a technical brilliance like Bahubali 2 before. The film created sensation. It should be a torch bearer for more period films and films related to royal kingdoms in future. Those who did not get scope to see the film should see it in multiplexes or single-screen theatres.